Each light up baton is 18 inches long and is comprised of 3 ultra-bright LEDs (red, green, and blue) built inside a large foam stick. 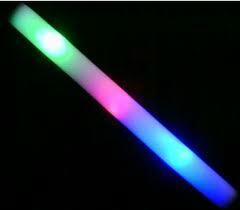 The batons feature 6 different lighting options, including a multi-colored flashing sequence, a color-changing sequence, a single-color flashing sequence, and more. Perfect for concerts, school spirit events, sporting events, and other shows. Can also be used as a flag marker for night sports.